CHARLIE Spargo has football in his blood. His father Paul played 90 games for North Melbourne and Brisbane and his grandfather Bob Spargo notched 80 matches for Footscray. Bob’s brother Ricky played 64 matches for Footscray, while Charlie’s great-grandfather Bob Snr finished third in the 1936 and 1940 Stawell Gift Finals and played for the Dogs and Melbourne. If, as expected, the newest Spargo on the scene finds a home on draft night, he will be a fourth generation VFL/AFL player. The other four members of his family to have reached the elite level all played 64 or more games, but none reached the magical 100-barrier. Nevertheless, this is a lineage of monarchal proportions — albeit underrated. Charlie — a pocket-sized midfielder/forward that has been compared to GWS star Toby Greene — has not been seen in a game since June 11, after he attempted to tackle likely top-four pick Patty Dow while sitting on his knees playing for the Allies in the national carnival. Dow, who has been compared to Patrick Dangerfield, brushed past Spargo’s outstretched arms and ended the Albury product’s season in one second of brutal power and speed. “I’ve never had an injury before so it hasn’t been easy,” Spargo, who sat his final VCE exam on Monday, told foxfooty.com.au. “He was running past — I shouldn’t have even tried because he was going to shrug me off anyway — it just ripped out. Despite this setback, Spargo had enough runs on the board. In 2015 he claimed the Alan McLean Medal as the best player for the Division 2 Under 16 national carnival, where he averaged 29 disposals and 2.5 goals per outing. Playing for the Murray Bushrangers in the TAC Cup last season, he averaged 19 touches and a goal per game. His form was, at worst, strong and, at best, outstanding for Melbourne Grammar early in 2017, which is why the medical staff and coaches are taking a long-term perspective on his shoulder. 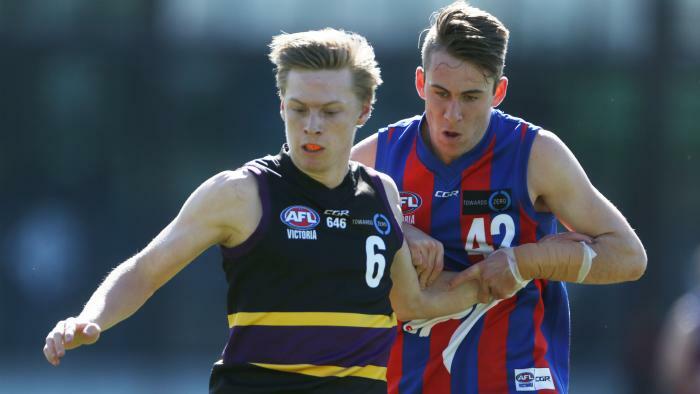 “It was decided the best course of action is to have it operated on so that, if he does get drafted, he can hit the ground running at an AFL club in the pre-season,” AFL Academy coach Luke Power said in June. Spargo is one of the smallest players in this year’s draft crop at 173cm — 9cm shorter than his father Paul. And given he has been unable to lift weights until recently because of his shoulder reconstruction, putting on muscle mass will have to wait until he finds a club. But Spargo is not concerned about his lack of size. And that sentiment, much like his innate ability to read a ball off the pack and sprint away from an opponent, comes from his father. “Dad gives me belief, mainly because of my size,” the soon to be 18-year-old said. Who can blame the younger Spargo? His dad is one of the most successful coaches in the Ovens and Murray Football League history, coaching five flags. “I don’t worry about my size on the field,” Spargo continued. “It doesn’t faze me at all. But off the field you wonder whether people are looking at you and saying you are too small to play AFL. That’s the only time I worry about my height. Spargo has a refreshingly honest way about him. He’s happy to admit he’s expecting to be drafted, maybe even as high as No. 15 “at the absolute peak”, but more likely in the 20s or 30s. For him, it doesn’t matter, so long as he gets picked up. Moving interstate is not a concern given he packed up his belongings and made the transition from Albury to Melbourne to attend boarding school as a Year 10. “I had to get out of there,” he said. “I like going home sometimes, but back when I lived there things weren’t going well. I was mucking around at school and Melbourne Grammar has been the best thing for me. “I’m a country boy. I didn’t struggle at all with boarding. You don’t have any down time or have time to sit down and think of how homesick you are. I was fine and have loved it. Up until earlier this year Spargo was certain he would end up at GWS as Albury fell in the club’s zone. But then the AFL changed the regions and 17 other clubs perked up and took notice of him again. “I was playing for the Giants academy that weekend and I found out on the Wednesday night,” he reflected. Given Spargo supports North Melbourne, it’s not hard to understand why Brent Harvey was his favourite player growing up. “He could come back and play now and has been killing it in the Northern Football League,” he said. In fact as of Friday night, there is a one in 18 chance he could be working with his hero as early as next week. And as the fifth member of his family to play VFL/AFL football, he would continue a tradition which began in Round 7, 1934 when his great-grandfather debuted for Footscray against Melbourne at the Western Oval.